Apple today updated its investor relations page to announce that it will share its earnings results for the fourth fiscal quarter (third calendar quarter) of 2018 on Thursday, November 1. The earnings release will provide a look at sales of the new iPhone XS and XS Max during their first week of availability, and we may hear some details on how well the Apple Watch Series 4 sold. Apple has not provided launch weekend sales for the iPhone XS and XS Max, so earnings will mark the first look at how well the updated devices sold compared to the iPhone 8, 8 Plus, and X.
Apple's guidance for the fourth quarter of fiscal 2017 includes expected revenue of $60 to $62 billion and gross margin between 38 and 38.5 percent. In 4Q 2017, Apple posted revenue of $52.6 billion and gross margin of 37.9 percent. The quarterly earnings statement will be released at 1:30 PM Pacific/4:30 PM Eastern, with a conference call to discuss the report taking place at 2:00 PM Pacific/5:00 PM Eastern. 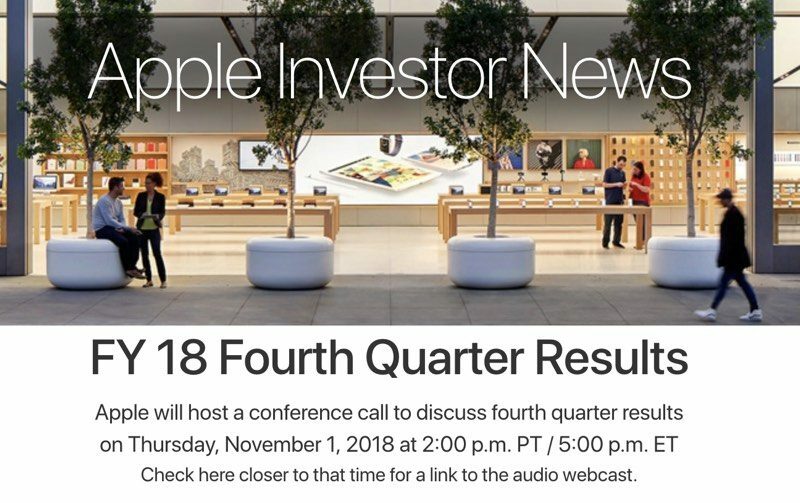 MacRumors will provide coverage of both the earnings release and conference call on November 1. Spoiler alert: lots of money. Most of the time Apple stock falls after earnings. A lot of people with inflated expectations decide to sell after earnings. Instead, Apple tends to rise during the long periods BETWEEN earnings reports. 8 out of the last 10 iPhone releases, APPL slid immediately after the release & didn’t get back up to pre-release levels for about 60 days. This year, they’re hitting all time highs 2 weeks after the release. Last earnings report, on 07/31/18, sent AAPL into an IMMEDIATE uptick... something like 3% in a single day, if I recall correctly.